Another one of Color Club's fun shaped, nail art essentials, hologram flowers are young, fun and bright! They shine with a slight twinkle but just enough to make a manicure shine! They are hollow in the middle which allows your nail polish shade to peep through. This sprinkle is just the right add-on to make your manicure look fun. 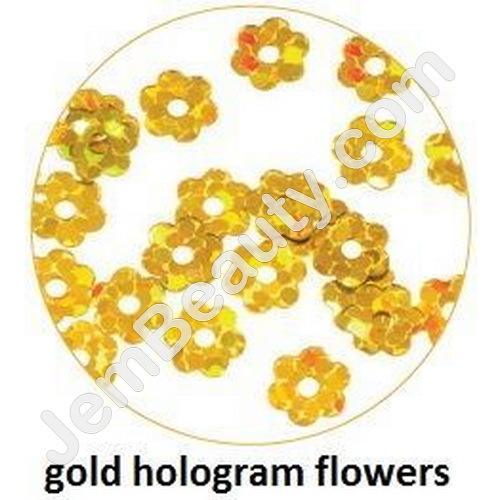 This nail art hologram flowers are also available in silver, gold, rose, blue, aqua, red, green, pink, black, purple, topaz and peridot. Apply Top Coat to clean nail. Sprinkles may be used with Clear Acrylic or Gel overlay. Cobalt Cuticle Nipper 16 4.5"